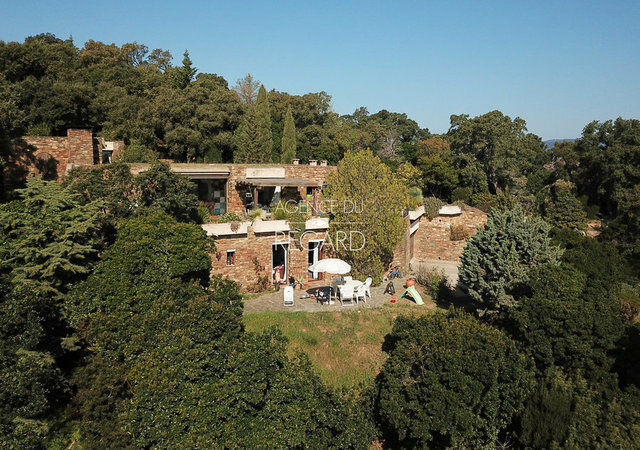 In Bormes-les-Mimosas, in the private domain of Gaou Bénat, this property of about 2,388sqm enjoys a beautiful sea view. The sandy beach of the domain with its sailing school and its restaurant are 20 minutes walk . The house of about 158sqm built in the 80s, is modern with a flat green roof and dry stone. Protected from looks and noise, it is completely integrated into the greenery. It hosts two apartments interconnected by an internal staircase. Renovations to predict. Cellar. Garage.